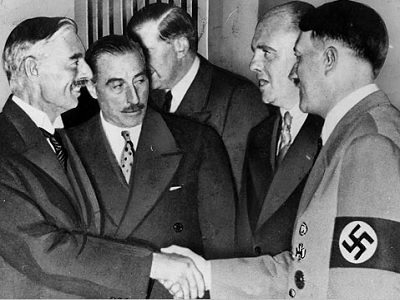 Neville Chamberlain, UK Prime Minister (1937-40) with Hitler in 1938: how could anyone explain that? When the Palestinians demand a withdrawal from the 1967 borders, the Israeli response is No because those borders are purportedly “indefensible”. When they ask for a bi-national state, the response is, also, negative because that would be the end of Israel as a “Jewish state”. When they insist that occupied East Jerusalem be the capital of their future state, they are reminded that the status of Al-Quds is non-negotiable for Jerusalem is the “undivided, eternal capital of the Jewish people”. And the Right of Return is not even up for grabs. When the Palestinian authority demands the freezing of settlements, it is, at best, told that what’s going is not the construction of a settlement but the natural growth of already existing settlements. Israel points to the Palestinian refusal of the unilateral withdrawal from Gaza in 2005 as a sign of their unwillingness to compromise. But could the FLN have accepted a partial withdrawal of the French settlers from Algiers or the Congress party a similar scheme, based on truncated sovereignty, applied solely to Calcutta as gesture of good will on the part of the British in India?? When Palestinian political movements and civil society engage in non-violent protest, they are met with tear gas and military barricades. Those who launched the BDS movement are labeled “Jew-haters” and their supporters worldwide accused of functioning as a “band of anti-Semites and hypocrites”. Confined in their enclaves, cut off the outside world, surrounded by Jewish settlements, Palestinians are supposed to acquiesce to their fate and suffer in silence. The sporadic flares of violence, born out of frustration and despair, are systematically decontextualized and misunderstood. They are depicted as a resumption of violence as though the occupation was not in and of itself a form of violence. If it is morally wrong to laud or encourage the indiscriminate use of violence, be it through a knife-killing spree or a car-crashing frenzy, it is likely wrong to ignore the context in which violence grows. As evidenced by the killing of an Eritrean, the stabbing of an Arab-looking Jew or the shooting of an Iraqi Jew by another one, the random killing of Arab Palestinians by settlers, the collective psyche of the Israeli public is increasingly infused with the neuroses of mob-lynching and racist scapegoating. Worse still, those killed are systematically labelled “Arab terrorists” until their creed or ethnicity is identified, regardless of their behavior. Upon learning they are Jews, however, the label “terrorist” vanished immediately after from the media and official narrative. If an Israeli populace that does not live under occupation can instinctively engage in such vile form of violence, what can one say about a traumatized people living under military occupation for over 40 years, deprived of its freedom of movement and subject to countless forms of humiliation? Jews have since 1948 a homeland; an independent sovereign state. This is an undeniable reality, a fact on the ground, irrespective of whether some Palestinians accept or deny it. It’s been decades that this cycle of violence is repeating itself and the reason is simple: the root causes of violence have remained the same. Political and religious leaders may bestow their seal of approval upon a youth uprising. They do not start the revolt although they may prove to be often very adept at riding the wave of discontent associated with it. Therefore, they often use its momentum as an opportunity to engage in demagoguery for purely political gains. So Intifadas are not preprogramed upheavals one can initiate at the drop of a hat. They are the result of a long process of pent-up anger and resentment — the product of a simmering situation waiting to boil over at any moment. Thus, anything could have triggered the explosion; hence the need to contextualize these cyclical incidents and properly analyze their genesis. Unfortunately, efforts are rarely made to apprehend the complexity of the issue and infer appropriate conclusions. The media, for instance, seldom mention the most important factor at play — and that is the chronic violence borne by Palestinians called the “OCCUPATION.” Western media talk only about “resumption of violence” when some spectacular individual acts of violence targeting Israeli citizens take place; the unbearable circumstances experienced by Palestinians are overlooked. The violence of permanent siege, physical dispossession, daily humiliation at check-points and in the streets, painful separation of families, near-starvation, repeated closures of businesses and schools, ban on travel, home demolition, uprooting of trees, omnipresence of armed soldiers and threatening settlers at every corner, all of this is not considered violence and thus not newsworthy. It is the order of things, the preferred status quo, that which does not disturb the quietness of the opulent middle class in the high-tech suburbs of Tel-Aviv, the raucous parading of Jewish bigots in Al Quds and Hebron, the windsurfing of beachgoers at Eilat, the camping of IDF retirees on the Red Sea and so on. Despite their physical proximity from the occupied territories, the Israelis who enjoy this world-class lifestyle are nevertheless, geographically and emotionally, disconnected from the harsh conditions endured by the Palestinians. They cannot empathize with them, let alone realize that the prize of their comfort may also derive from the pain and subjugation of another people; a people so close in space yet so remote in time. Thus, the ruined homes of Gaza, the squalor of Yarmouk and Zaatari, the endless exile of refugees, the daily human gridlock at check-points, the regular harassment of settlers, the naval blockade of coastlines, the fate of 5 million destitute souls abroad, the scarcity of water in the occupied land, the overcrowded flats in dumpy towns, the shooting at random of pedestrians, the jailing of underage children etc., are not considered a form of violence because Israelis don’t experience such misery. Even worse, Palestinians are subjected to a continuing process of dehumanization. The latest chapter, in this decades-long effort of objectification, is the attempt by Netanyahu to whitewash Nazism and Hitlerism from the crimes of the Holocaust. For Netanyahu, the mighty Führer of the III Reich was so faint of heart so as to be at the beck and call of an Arab Mufti from a faraway British colony. This is frankly the apex of historical revisionism and falsification. If one were to follow such an absurd logic, then one could say that Muslims initiated the medieval Christian Inquisitions and inspired Tsarist Russia to create the Pale of settlement. However, that effort to absolve Hitler from his crimes has only one objective: demonizing the Palestinians so as to deny them their inalienable rights to self-determination and freedom. If the Mufti met with Hitler, so did prominent French politicians, Russian political leaders (e.g. the Molotov–Ribbentrop Soviet Nazi Pact) and famous American industrialists and businessmen such as Henry Ford and Joseph Kennedy etc. And so did Churchill meet Mussolini. One could understand, without justifying or excusing the Mufti’s undertaking, for his land was directly threatened and coveted by European Jews but the French cuddling of Hitler and American indifference to his early crimes, how could anyone explain that?? – Mohamed El Mokhtar Sidi Haiba is a social and political analyst, whose research interest is focused on African and Middle Eastern Affairs. His work has appeared in Palestine Chronicle, Al-Ahram Weekly, Third World Network and Middle East Eye among others. He contributed this article to PalestineChronicle.com. محاججة منطقية و بسيطة تبين للقارئ الغربي حقيقة الظلم الواقع على الفلسطيني اليوم. نعم، كل ما يلزم المتابع هو نظرة متوازنة تأخذ بالإعتبار السياق الذي ظهرت فيه بعض ردات الفعل الفلسطينية العنيفة، و التي هي بطبيعتها أعمال متفرقة، فردية و بأدوات بدائية، تجاه عنف دولة إسرائيل الرسمي الدائم المنظم و المسلح بأعتى الإمكانيات العسكرية و الأمنية. As a westerner having visited the West Bank I think this article is very well balanced and perceptive. Also very intelligent! This is very well-written. Before you label Palestinians “terrorists,” look at the roots of the problem: occupation. I think it would have been abnormal if the Palestinians just acquiesced to the occupation did nothing to defend themselves. Unbiased and wonderfully written . Anyone in the west is aware of the suffering of those indigenous Palestinians under the occupation . Netanyahu attempts to dehumanize Palestinians is a joke. He is himself ianother version of Hitler . I also think that people should have access to different and various sources , from different points of views that tackle the question of Arab Israeli conflict for a better understanding .